A mutant tomato with a face resembling a Chinese lion mask was harvested from a field in the city of Yahata in Kyoto prefecture. The common momotaro tomato is 3 times the normal size, measuring 10 cm in diameter and weighing 150 grams. The unusually long rainy season is believed to have caused the fruit to absorb too much moisture. The surprised farmer, who has been raising tomatoes for more than 30 years, says, "It's the first time I've ever seen a tomato with a fully formed face." No word yet on how it tastes.
" 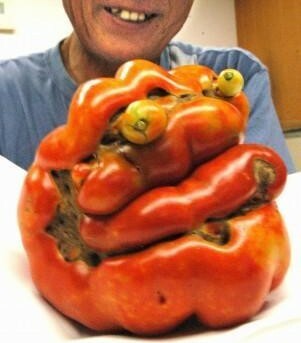 The surprised farmer, who has been raising tomatoes for more than 30 years, says, �It�s the first time I�ve ever seen a tomato with a fully formed face.� "
What the hell was wrong with his face for 30 years ? I think you need to practice reading. this website is crap wot kinda people would do this in there spare time and publish it on the web!!! That can be eaten xD? this is not snack time!!!! Quezi » Is tomato a fruit or vegetable?